Juniper is a wonderful oil to consider using during this time of transition from winter to spring. In Chinese five-element acupuncture, winter is associated with the kidney & bladder meridians and spring supports the liver & gall bladder meridians. Juniper works well to detoxify both these organs and their meridians bringing balance and harmony to the body. Juniper also protects against infection and is a perfect defense against those lingering colds and flu. It stimulates the immune system to bring rejuvenation and vitality to the body after months of hibernation and stagnation. The crushed, dried berries of the Juniperus communis are steam distilled to extract the essential oil. The oil is produced mainly in Italy, France and neighboring countries along the Mediterranean. It has been used through out history as a disinfectant and was burned in hospitals and sick areas (along with Rosemary) to kill germs and keep infections at bay. 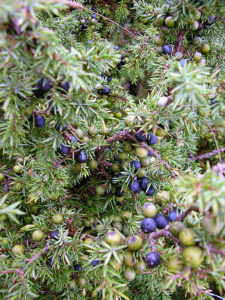 Juniper is also the base ingredient of gin. Juniper is renowned for its diuretic and detoxifying properties. The use of this essential oil in massage will help to eliminate toxic wastes and release sluggish body fluids. Especially after a long winter of inactivity and sedentary life, juniper can awaken the kidneys and encourage the release of stale urine; while strengthening and tonifying the urino-genital tract and relieving complaints such as cystitis and urinary infections. Juniper also helps with enlarged prostates where retention of urine is a problem. For those who were sick over the winter months and having difficulty in convalescing, juniper peps up sluggish eliminatory systems, allowing disease and infection to be thrown off more quickly, hastening a speedy recovery. Used in a sitz bath, juniper alleviates urinary problems and the discomfort of related symptoms such as itching and burning during urination. There is a warning in most of the reference books that juniper should not be used by those with kidney disease due to its nephrotoxic effect. Spring is a time to seriously think about detoxifying the liver and juniper can help. Massage with juniper stimulates the liver’s ability to cleanse waste products from the body. Used in an alcohol rub or in a compress juniper is good for cellulitis and other problems associated with stagnant fluids and fluid retention. Arthritis, rheumatism and gout are also considered stagnant conditions because of poor eliminatory capabilities so juniper can be equally helpful with these complaints. Even obesity can be addressed with juniper baths and massage. Of course juniper, being such a strong diuretic should not be used on a daily basis because it can stress the kidneys with overuse. Drinking plenty of water can alleviate any dehydration or distress from detoxification. Skin problems such as acne, dermatitis and eczema can be soothed and toned with juniper added to a cleanser. It is a good astringent and can speed up the healing of weepy wounds and help unclog pores. For animals, juniper subdues fleas and lice, and works well on mange and dermatitis. Juniper works on the mental levels as well as the physical. Burned in an aroma lamp, it helps with poor memory, confusion and forgetfulness. It cleanses emotions and balances the psyche. When one is over taxed or depleted, when one needs to give more than they feel they are capable, or when caring for someone feels like a burden, then juniper (with rosemary) is a perfect pick-me-up. It protects against unwanted energetic influences and clears the air of psychic debris. As it detoxifies the body, so juniper can detox the mind.